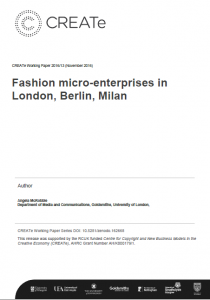 This report provides an account of a series of interviews, observational visits and hosted events with 8-10 fashion designers in three cities: London, Berlin and Milan, carried out from 2012-2016. In some cases we interviewed the same designers two or three times over a period of nearly three years. The research project also entailed documented conversations and meetings with a range of fashion experts, consultants, legal advisors and policy makers in each city. Often these took place within the context of organised events undertaken as part of the research process. The aim was to investigate the kind of start-ups or micro-enterprises which have come into being in the last decade. We were interested in whether these were the outcome of pro-active urban creative economy policies or if they were self-organised initiatives, a reaction to the crisis of the euro-zone of 2008 and the consequent recession. Was it the case that long-term austerity policies and exceptionally high rates of youth and graduate unemployment across Europe had spawned these kinds of seemingly independent economic activities? We were also minded to consider the role of intellectual property (IP) and copyright in fashion as part of the wider UK government agenda for growth and wealth creation within the creative economy as a whole.